No sour cream, thank you for pointing that out. I have updated the directions. Gina, I’m making this recipe now to take to a party, but there’s something wrong. The instructions say to mix crab, avocados AND sour cream…. But the ingredients do not list sour cream. How much sour cream is required? Light, I assume? Please correct so I can ensure I make it accurately next time. Hi, Did you make it with sour cream? 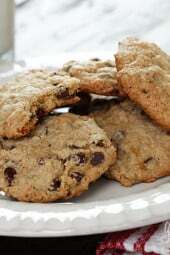 I was hoping I found a dairy free recipe until I read your post and realized it might have sour cream! Ok…did anyone answer you regarding the sour cream? This ingredient makes no sense for this recipe. I’m hoping to make this for a party this weekend. Thanks! How many added points for the baked chips? This looks so yummy! I am going to try this very soon! Thanks! My BF won't eat crab (unless it's in a crab cake) but he LOVED this. He had his w/ chips. I'm avoiding carbs so I had mine in romaine leaves. Really good. To say this is delicious is an understatement! It is to die for!! Thank you so much for posting this! 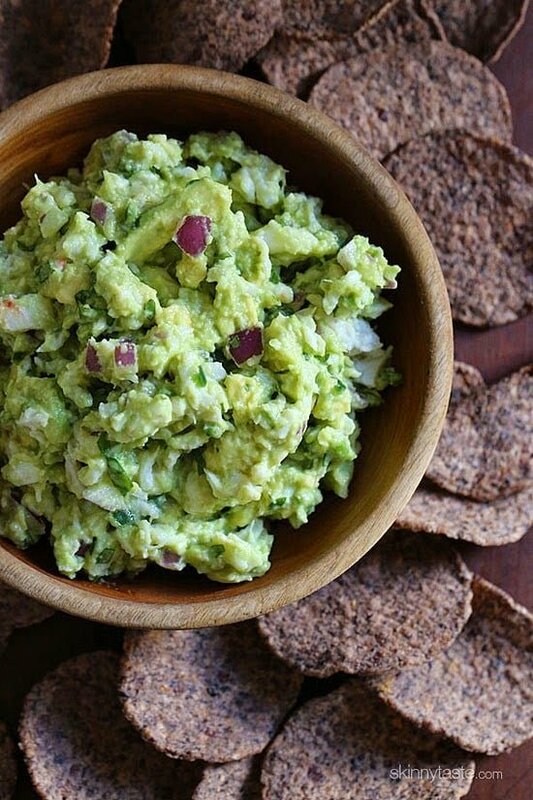 Mmmm… I love guac and crab… this sounds perfect! YAYYY @ under 100 calories this looks like a big taste bang for my calorie buck. THANKS! This looks amazing! 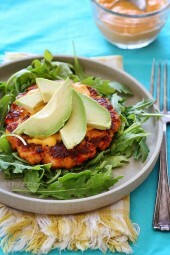 Crab and Avocado….. it's got to be!!! I think would be great on endive…. or as a dip for veggies too! Making this the next time I host my book club! Perfect!!! I love all the recipes I've made. But the best part is my kids love them too! OH MY! This sounds so good! Thanks! I'm not sure my original post went through, but based on nutritionals vs calories, something's wrong. Could you please post the actual values? I thought this might be too good to be true. As an above poster noted, if the NI is correct, then the calories are over 250, rather than 91. Maybe that's why it looks so super delicious. Thanks. It was a typo, I forgot to adjust the numbers but it's fixed now. Still low!! Love guacamole…love crab…never mixed them together in a bowl…what a fantastic idea! The macros don't add up to 91 calories. Could you clarify? According the the macro breakdown there should be ((31-5)*4)+(27*4)+(6*9)= 266 calories/serving. Sorry, I just went back and realized typos, I adjusted! Why are the carbs so high in this dish? Seems like it would be low-carb. Crab in guacamole?! You are SUCH a genius! I could face plant all up in a bowl of this right now. And it's 4 am. So, that's saying something. Pinned! This looks delicious! I had crab topped guacamole for the first time recently at a new restaurant her in Phoenix and I LOVED it! 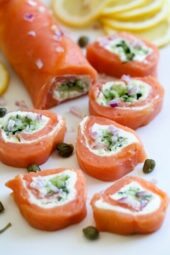 Will be making this the next time I want an easy appetizer! yummy, lots of lime juice and cilantro are the key to god guac in my opinion! Crab and guacamole sound like a match made in heaven! This looks amazing! Would be perfect for a party! Looks tasty & easy to veganize with seitan instead of crab. Red onion is an awesome option for guac!